On 19 September 2009 the Polish Armed Forces Memorial was unveiled at the National Memorial Arboretum. The memorial commemorates the contribution of the Polish Forces to the allied victory in World War 2. 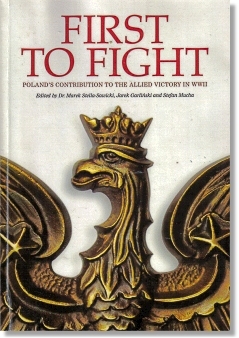 Prior to the dedication of the Polish Armed Forces Memorial the book First to Fight was published. This book relates how Poland fought throughout the war on all fronts and details the sacrifices and contributions the Polish Armed Forces made. Poland was attacked by Nazi Germany on 1 September 1939 and two days later Britain and France declared war on Germany. The 2nd World War and Poland's fight for freedom had begun. The German attack on Poland was followed on 17 September 1939 by the invasion of Poland from the east by the Soviet Union. The Germans and the Soviets had signed a non-agression pact in August 1939 and had agreed to divide Poland between themselves. Polish losses were considerable with around 68,000 men killed (p. 17). German forces captured over 400,000 Polish prisoners and the Soviets around 200,000 (p. 17). Polish forces who escaped capture made their way to neighbouring Romania, Hungary or the Baltic States. There they were interned but many escaped and made their way to France where the Polish government and armed forces were being reformed. On 30 September General Wladyslaw Sikorski was appointed Prime Minister of the Polish government-in-exile in France. In the spring of 1940 Germany attacked the Low Countries and France. Six weeks later France had surrendered. Polish forces in France vowed to fight on and made their escape to Great Britain. During the summer and autumn of 1940 the German Luftwaffe launched a bombing campaign against Great Britain. Their intention was to defeat the Royal Air Force and then launch an invasion of Britain. The Germans however failed to attain their objective of air superiority and the invasion never took place. Poland's contribution to the Battle of Britain was considerable. Great Britain and Poland signed an agreement in June 1940 in which the Poles had their own Air Force in the structure of the RAF. A number of other Polish fighter and bomber squadrons became operational later. 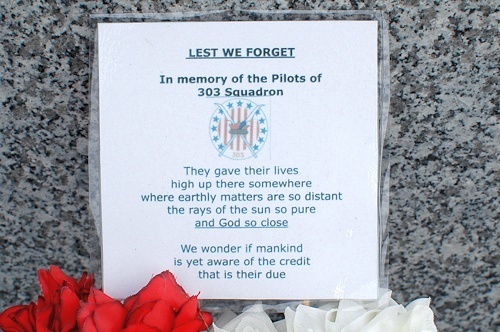 303 squadron was the most successful of all the RAF squadrons in the Battle of Britain! The Germans used an Enigma Cipher Machine to encode their secret communications. It looked like a more complex version of a typewriter. The user of the machine typed in a message and then turned various rotors to scramble the message. The Enigma machine had been developed by a German engineer called Arthur Scherbius at the end of the 1st World War. In 1932 Polish mathematicians Marian Rejewski, Henryk Zygalski and Jerzy Rozycki succeeded in breaking the code. The Germans however kept enhancing the machine and changing its settings. The possible permutations for the machine settings ran into many millions. In July 1939 with war imminent the Poles arranged a meeting with the British and French in Warsaw and agreed to give them all that they had learned about the Engima Machine. The British setup a code breaking center at Bletchley Park in Buckinghamshire. It was at Bletchley Park that the Government Code and Cypher School worked on breaking the Engima codes. The product of this intelligence work was called ULTRA. It is safe to say that ULTRA contributed greatly to the Allied victories in the Battle of the Atlantic, the Mediterranean, North Africa and elsewhere, thereby probably shortening the war. However it was the initial Polish breakthrough at the heart of these achievements that is still considered to be one of the great feats of cryptanalytical history. In October 1941 General Wladyslaw Sikorski on a visit to the Polish 4th Rifle Brigade training in Scotland renamed it the 1st Independent Parachute Brigade. Colonel Stanislaw Sosabowski was the Brigade's commanding officer. The intention had been that the Parachute Brigade would be used for operations in Poland to assist in any general uprising against the Germans. In 1944 the British requested that the brigade should be placed under its command. The Polish government-in-exile agreed to this request. In September 1944 the Polish Parachute Brigade, together with British and American airborne forces, took part in Operation Market Garden: an attempt to seize and hold bridges over the River Rhine. The operation was not a success. The story of Poland's extensive contribution to the victory in World War 2 is told on 16 granite plaques at the Polish Armed Forces Memorial. Publisher - Polish Ex-Combatants' Association of Great Britain under licence from MSS Consulting, 2009. This page was added on 01 June 2014.